She recently branded Caitlyn Jenner 'absurd' for claiming she came up with the idea for Keeping Up With The Kardashians. So it was unfortunate timing for Kris Jenner on Wednesday night, as she ran into her ex-husband at an event at Nobu restaurant in Malibu. 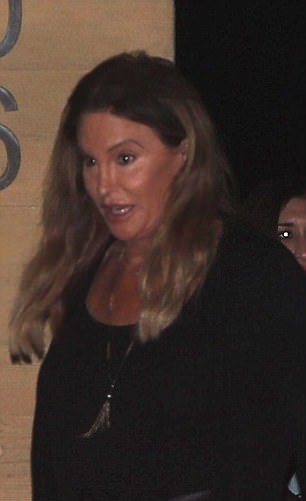 The momager, 61 - who split from Caitlyn - then Bruce, 67, in 2015 before her gender transition - flashed a defiant smile as she left the exclusive eatery. The awkward run-in comes after Kris joked that her ex-husband should be reminded the mega money-spinning reality show bears the Kardashian, not Jenner, name. Speaking in an interview with The Hollywood Reporter to celebrate 10 years of the E! series, Kris hit back at the claims Caitlyn made in her memoir The Secrets Of My Life earlier this year. Kris said: 'It's so absurd. I'm not sure what the motivation was for her to say something like that. The couple were married from 1991 until 2015, before former Olympic gold medalist Bruce transitioned to Caitlyn.